Last year eight University of Surrey students went and spent their placement years at GlaxoSmithKline (GSK) who have a range of placement opportunities across business, engineering and science. Claire, Marine, Samantha and Emma are four of the students who have told us how they spent their year. The 2019/20 placement applications have opened, find out more about why and how you should apply below. We asked last year’s GSK students for some advice for current second years wishing to apply. Their advice about how to stand out in both application and interview gives some insight to students who decide to apply this year. 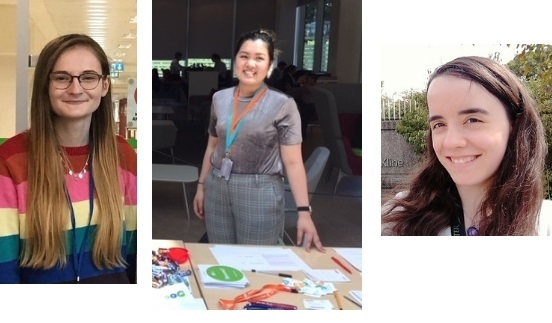 If you would like to read more about University of Surrey’s placement students, Marine Tooh, Claire Seaman, Emma Hobbs and Samantha Walker year at GSK, please click on their names to read their blogs. GSK are advertising 300 placement roles across business, engineering and science. They accept any degree discipline for their commercial roles, and the technical roles have more specific degree subject requirements. There is no deadline for applications and posts will close as soon as enough applications have been received, so we do advise applying early! GSK will be at the University on 10th October to give guidance on the GSK interviews from 4-5pm. Details of how to book will be available nearer the time. For details of the Placement scheme at GSK have a look at their Industrial placements web page. For details of the specific jobs advertised please have a look at the GSK job vacancies on Surrey Pathfinder.